Bioware Austin announced Star Wars: The Old Republic at a press conference on October 27, 2007. The game is one of the most anticipated in years. It follows Star Wars Galaxies (the first SW MMORPG) from Sony. 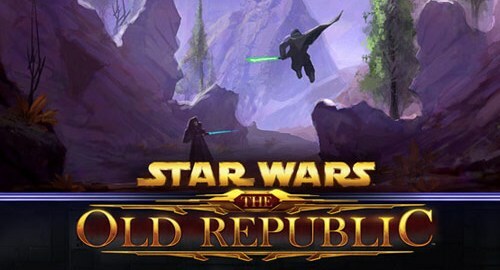 Bioware is the company behind the hugely popular Star Wars: Knights of the Old Republic series. There are plenty of informative articles about this game already available on the net, but there are several key things about this game that I want to discuss. Because it will effect my bias towards this game, I want to say that I am a Star Wars fan, I played Galaxies for years (and actually liked it) and was never a huge fan of KOTOR. Game Engine. This game uses the Hero Engine. This is an advanced game engine which will bring a new and unique feel to the game. It offers loads of customization options for characters and is the key to the games “Consequence System” BW is so proud of (I’ll get to that). This is also an important feature because it utilizes new technology that allows developers from different regions to work simultaneously on the server, greatly decreasing production time. The fact that BW is not creating their own game engine from the ground up is also noteworthy because that will most likely save development time and money. Its Star Wars. I love the idea of a Star Wars MMO because the universe is perfect for it. Star Wars has always had that adventurist spirit because the world is so big and filled with mystery. Its a great place for Role Playing because there are so many options and any story can be realistic. Visuals. I am NOT a fan of the cartoon-ish graphics of games like WOW, and when BW started tossing around the phrase “stylized” I got worried. However, the further this game gets in development, the more I like what I see. It doesn’t have the realistic(ish) graphics that Galaxies has, but they look refreshing and new. The landscapes are beautiful. One thing about galaxies I did not like was the dull and drab landscapes, and BW has done a good job on what I have seen so far. Not enough MMO in my MMORPG. BW is very very VERY concerned about story. In fact it is all they have been talking about. If I didn’t already know this was going to be an MMO, there is no evidence out there that it is. I will admit that at this early stage of development, its entirely possible that we will hear more before the game comes out, but I am ready for them to stop talking about story. I get it already. There is mass hysteria around the interwebs that the game will not cater to Role Players (like me). We are die hard gamers and although we make up a minority, we have a big voice and are not above stomping our feet and holding our breath. Things like dedicated crafting classes, a player driven economy, highly customizable items/clothes and general role player tools (emotes, cantinas, housing, guilds, player cities, etc…) could possibly be missing from this game. The RP community is worried that BW is so concerned with telling a good story that they will forget many of us like to take a break and role play in our role playing game. This is something Galaxies did extremely well and many Star Wars fans who enjoyed that aspect of the game are really eager to see if TOR will deliver. Simple/Linear Character Development. I know we haven’t even seen the release of all the classes yet. (So far we have Trooper, Bounty Hunter, Smuggler, Jedi and Sith with 3 classes yet to be revealed. That gives us 4 classes per faction. We don’t know what kind of progression there will be but hopefully it will have a lot of options. One of the things I disliked about Lord of the Rings Online was that the character development was completely linear. Every Champion was exactly the same as every other champion. In SWG (pre-NGE) there were limitless choices and combinations that really made the player feel unique, which is great for immersion and role play. I’m really looking forward to this game. BioWare has a great reputation for making RPGs and seems to be taking their time and trying to do things right as they enter the MMO world. All my concerns for the game stem from the fact that I am a die hard role player. BioWare seemingly loves to torture me by not saying word about that aspect yet, which makes me nervous and twitchy. If the game does end up released as basically a single player game with a subscription fee, I will still most likely be checking it out. It just won’t be the RPG replacement I’ve been waiting for. This entry was posted on August 25, 2009 at 11:56 am and filed under Games. You can follow any responses to this entry through the RSS feed.